The DNA repair ability of a cell is vital to the integrity of its genome and thus to the normal functionality of that organism. Many genes that were initially shown to influence life span have turned out to be involved in DNA damage repair and protection. Paul Modrich talks about himself and his work in DNA repair. DNA damage, due to environmental factors and normal metabolic processes inside the cell, occurs at a rate of 10,000 to 1,000,000 molecular lesions per cell per day. While this constitutes only 0.000165% of the human genome's approximately 6 billion bases (3 billion base pairs), unrepaired lesions in critical genes (such as tumor suppressor genes) can impede a cell's ability to carry out its function and appreciably increase the likelihood of tumor formation and contribute to tumour heterogeneity. Ionizing radiation such as that created by radioactive decay or in cosmic rays causes breaks in DNA strands. Intermediate-level ionizing radiation may induce irreparable DNA damage (leading to replicational and transcriptional errors needed for neoplasia or may trigger viral interactions) leading to pre-mature aging and cancer. Thermal disruption at elevated temperature increases the rate of depurination (loss of purine bases from the DNA backbone) and single-strand breaks. For example, hydrolytic depurination is seen in the thermophilic bacteria, which grow in hot springs at 40–80 °C. The rate of depurination (300 purine residues per genome per generation) is too high in these species to be repaired by normal repair machinery, hence a possibility of an adaptive response cannot be ruled out. Industrial chemicals such as vinyl chloride and hydrogen peroxide, and environmental chemicals such as polycyclic aromatic hydrocarbons found in smoke, soot and tar create a huge diversity of DNA adducts- ethenobases, oxidized bases, alkylated phosphotriesters and crosslinking of DNA, just to name a few. In human cells, and eukaryotic cells in general, DNA is found in two cellular locations – inside the nucleus and inside the mitochondria. Nuclear DNA (nDNA) exists as chromatin during non-replicative stages of the cell cycle and is condensed into aggregate structures known as chromosomes during cell division. In either state the DNA is highly compacted and wound up around bead-like proteins called histones. Whenever a cell needs to express the genetic information encoded in its nDNA the required chromosomal region is unravelled, genes located therein are expressed, and then the region is condensed back to its resting conformation. Mitochondrial DNA (mtDNA) is located inside mitochondria organelles, exists in multiple copies, and is also tightly associated with a number of proteins to form a complex known as the nucleoid. Inside mitochondria, reactive oxygen species (ROS), or free radicals, byproducts of the constant production of adenosine triphosphate (ATP) via oxidative phosphorylation, create a highly oxidative environment that is known to damage mtDNA. A critical enzyme in counteracting the toxicity of these species is superoxide dismutase, which is present in both the mitochondria and cytoplasm of eukaryotic cells. Senescence, an irreversible process in which the cell no longer divides, is a protective response to the shortening of the chromosome ends. 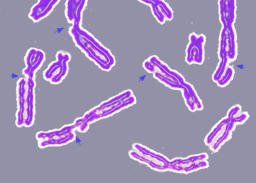 The telomeres are long regions of repetitive noncoding DNA that cap chromosomes and undergo partial degradation each time a cell undergoes division (see Hayflick limit). In contrast, quiescence is a reversible state of cellular dormancy that is unrelated to genome damage (see cell cycle). Senescence in cells may serve as a functional alternative to apoptosis in cases where the physical presence of a cell for spatial reasons is required by the organism, which serves as a "last resort" mechanism to prevent a cell with damaged DNA from replicating inappropriately in the absence of pro-growth cellular signaling. Unregulated cell division can lead to the formation of a tumor (see cancer), which is potentially lethal to an organism. Therefore, the induction of senescence and apoptosis is considered to be part of a strategy of protection against cancer. It is important to distinguish between DNA damage and mutation, the two major types of error in DNA. DNA damage and mutation are fundamentally different. Damage results in physical abnormalities in the DNA, such as single- and double-strand breaks, 8-hydroxydeoxyguanosine residues, and polycyclic aromatic hydrocarbon adducts. DNA damage can be recognized by enzymes, and thus can be correctly repaired if redundant information, such as the undamaged sequence in the complementary DNA strand or in a homologous chromosome, is available for copying. If a cell retains DNA damage, transcription of a gene can be prevented, and thus translation into a protein will also be blocked. Replication may also be blocked or the cell may die. In contrast to DNA damage, a mutation is a change in the base sequence of the DNA. A mutation cannot be recognized by enzymes once the base change is present in both DNA strands, and thus a mutation cannot be repaired. At the cellular level, mutations can cause alterations in protein function and regulation. Mutations are replicated when the cell replicates. In a population of cells, mutant cells will increase or decrease in frequency according to the effects of the mutation on the ability of the cell to survive and reproduce. Although distinctly different from each other, DNA damage and mutation are related because DNA damage often causes errors of DNA synthesis during replication or repair; these errors are a major source of mutation. Given these properties of DNA damage and mutation, it can be seen that DNA damage is a special problem in non-dividing or slowly-dividing cells, where unrepaired damage will tend to accumulate over time. On the other hand, in rapidly-dividing cells, unrepaired DNA damage that does not kill the cell by blocking replication will tend to cause replication errors and thus mutation. The great majority of mutations that are not neutral in their effect are deleterious to a cell's survival. Thus, in a population of cells composing a tissue with replicating cells, mutant cells will tend to be lost. However, infrequent mutations that provide a survival advantage will tend to clonally expand at the expense of neighboring cells in the tissue. This advantage to the cell is disadvantageous to the whole organism, because such mutant cells can give rise to cancer. Thus, DNA damage in frequently dividing cells, because it gives rise to mutations, is a prominent cause of cancer. In contrast, DNA damage in infrequently-dividing cells is likely a prominent cause of aging. Cells cannot function if DNA damage corrupts the integrity and accessibility of essential information in the genome (but cells remain superficially functional when non-essential genes are missing or damaged). Depending on the type of damage inflicted on the DNA's double helical structure, a variety of repair strategies have evolved to restore lost information. If possible, cells use the unmodified complementary strand of the DNA or the sister chromatid as a template to recover the original information. Without access to a template, cells use an error-prone recovery mechanism known as translesion synthesis as a last resort. Cells are known to eliminate three types of damage to their DNA by chemically reversing it. These mechanisms do not require a template, since the types of damage they counteract can occur in only one of the four bases. Such direct reversal mechanisms are specific to the type of damage incurred and do not involve breakage of the phosphodiester backbone. The formation of pyrimidine dimers upon irradiation with UV light results in an abnormal covalent bond between adjacent pyrimidine bases. The photoreactivation process directly reverses this damage by the action of the enzyme photolyase, whose activation is obligately dependent on energy absorbed from blue/UV light (300–500 nm wavelength) to promote catalysis. Photolyase, an old enzyme present in bacteria, fungi, and most animals no longer functions in humans, who instead use nucleotide excision repair to repair damage from UV irradiation. Another type of damage, methylation of guanine bases, is directly reversed by the protein methyl guanine methyl transferase (MGMT), the bacterial equivalent of which is called ogt. This is an expensive process because each MGMT molecule can be used only once; that is, the reaction is stoichiometric rather than catalytic. A generalized response to methylating agents in bacteria is known as the adaptive response and confers a level of resistance to alkylating agents upon sustained exposure by upregulation of alkylation repair enzymes. The third type of DNA damage reversed by cells is certain methylation of the bases cytosine and adenine. Structure of the base-excision repair enzyme uracil-DNA glycosylase excising a hydrolytically-produced uracil residue from DNA. The uracil residue is shown in yellow. Base excision repair (BER) repairs damage to a single nitrogenous base by deploying enzymes called glycosylases. These enzymes remove a single nitrogenous base to create an apurinic or apyrimidinic site (AP site). Enzymes called AP endonucleases nick the damaged DNA backbone at the AP site. DNA polymerase then removes the damaged region using its 5’ to 3’ exonuclease activity and correctly synthesizes the new strand using the complementary strand as a template. Nucleotide excision repair (NER) repairs damaged DNA which commonly consists of bulky, helix-distorting damage, such as pyrimidine dimerization caused by UV light. Damaged regions are removed in 12–24 nucleotide-long strands in a three-step process which consists of recognition of damage, excision of damaged DNA both upstream and downstream of damage by endonucleases, and resynthesis of removed DNA region. NER is a highly evolutionarily conserved repair mechanism and is used in nearly all eukaryotic and prokaryotic cells. In prokaryotes, NER is mediated by Uvr proteins. In eukaryotes, many more proteins are involved, although the general strategy is the same. Mismatch repair systems are present in essentially all cells to correct errors that are not corrected by proofreading. These systems consist of at least two proteins. One detects the mismatch, and the other recruits an endonuclease that cleaves the newly synthesized DNA strand close to the region of damage. In E. coli , the proteins involved are the Mut class proteins. This is followed by removal of damaged region by an exonuclease, resynthesis by DNA polymerase, and nick sealing by DNA ligase. Double-strand breaks, in which both strands in the double helix are severed, are particularly hazardous to the cell because they can lead to genome rearrangements. It was noted in some studies that double-strand breaks and a "cross-linkage joining both strands at the same point is irreparable because neither strand can then serve as a template for repair. The cell will die in the next mitosis or in some rare instances, mutate." Three mechanisms exist to repair double-strand breaks (DSBs): non-homologous end joining (NHEJ), microhomology-mediated end joining (MMEJ), and homologous recombination (HR). In an in vitro system, MMEJ occurred in mammalian cells at the levels of 10–20% of HR when both HR and NHEJ mechanisms were also available. DNA ligase, shown above repairing chromosomal damage, is an enzyme that joins broken nucleotides together by catalyzing the formation of an internucleotide ester bond between the phosphate backbone and the deoxyribose nucleotides. In NHEJ, DNA Ligase IV, a specialized DNA ligase that forms a complex with the cofactor XRCC4, directly joins the two ends. To guide accurate repair, NHEJ relies on short homologous sequences called microhomologies present on the single-stranded tails of the DNA ends to be joined. If these overhangs are compatible, repair is usually accurate. NHEJ can also introduce mutations during repair. Loss of damaged nucleotides at the break site can lead to deletions, and joining of nonmatching termini forms insertions or translocations. NHEJ is especially important before the cell has replicated its DNA, since there is no template available for repair by homologous recombination. There are "backup" NHEJ pathways in higher eukaryotes. Besides its role as a genome caretaker, NHEJ is required for joining hairpin-capped double-strand breaks induced during V(D)J recombination, the process that generates diversity in B-cell and T-cell receptors in the vertebrate immune system. MMEJ starts with short-range end resection by MRE11 nuclease on either side of a double-strand break to reveal microhomology regions. In further steps, Poly (ADP-ribose) polymerase 1 (PARP1) is required and may be an early step in MMEJ. There is pairing of microhomology regions followed by recruitment of flap structure-specific endonuclease 1 (FEN1) to remove overhanging flaps. This is followed by recruitment of XRCC1–LIG3 to the site for ligating the DNA ends, leading to an intact DNA. MMEJ is always accompanied by a deletion, so that MMEJ is a mutagenic pathway for DNA repair. The extremophile Deinococcus radiodurans has a remarkable ability to survive DNA damage from ionizing radiation and other sources. At least two copies of the genome, with random DNA breaks, can form DNA fragments through annealing. Partially overlapping fragments are then used for synthesis of homologous regions through a moving D-loop that can continue extension until they find complementary partner strands. In the final step there is crossover by means of RecA-dependent homologous recombination. Translesion synthesis (TLS) is a DNA damage tolerance process that allows the DNA replication machinery to replicate past DNA lesions such as thymine dimers or AP sites. It involves switching out regular DNA polymerases for specialized translesion polymerases (i.e. DNA polymerase IV or V, from the Y Polymerase family), often with larger active sites that can facilitate the insertion of bases opposite damaged nucleotides. The polymerase switching is thought to be mediated by, among other factors, the post-translational modification of the replication processivity factor PCNA. Translesion synthesis polymerases often have low fidelity (high propensity to insert wrong bases) on undamaged templates relative to regular polymerases. However, many are extremely efficient at inserting correct bases opposite specific types of damage. For example, Pol η mediates error-free bypass of lesions induced by UV irradiation, whereas Pol ι introduces mutations at these sites. Pol η is known to add the first adenine across the T^T photodimer using Watson-Crick base pairing and the second adenine will be added in its syn conformation using Hoogsteen base pairing. From a cellular perspective, risking the introduction of point mutations during translesion synthesis may be preferable to resorting to more drastic mechanisms of DNA repair, which may cause gross chromosomal aberrations or cell death. In short, the process involves specialized polymerases either bypassing or repairing lesions at locations of stalled DNA replication. For example, Human DNA polymerase eta can bypass complex DNA lesions like guanine-thymine intra-strand crosslink, G[8,5-Me]T, although it can cause targeted and semi-targeted mutations. Paromita Raychaudhury and Ashis Basu studied the toxicity and mutagenesis of the same lesion in Escherichia coli by replicating a G[8,5-Me]T-modified plasmid in E. coli with specific DNA polymerase knockouts. Viability was very low in a strain lacking pol II, pol IV, and pol V, the three SOS-inducible DNA polymerases, indicating that translesion synthesis is conducted primarily by these specialized DNA polymerases. A bypass platform is provided to these polymerases by Proliferating cell nuclear antigen (PCNA). Under normal circumstances, PCNA bound to polymerases replicates the DNA. At a site of lesion, PCNA is ubiquitinated, or modified, by the RAD6/RAD18 proteins to provide a platform for the specialized polymerases to bypass the lesion and resume DNA replication. After translesion synthesis, extension is required. This extension can be carried out by a replicative polymerase if the TLS is error-free, as in the case of Pol η, yet if TLS results in a mismatch, a specialized polymerase is needed to extend it; Pol ζ. Pol ζ is unique in that it can extend terminal mismatches, whereas more processive polymerases cannot. So when a lesion is encountered, the replication fork will stall, PCNA will switch from a processive polymerase to a TLS polymerase such as Pol ι to fix the lesion, then PCNA may switch to Pol ζ to extend the mismatch, and last PCNA will switch to the processive polymerase to continue replication. The packaging of eukaryotic DNA into chromatin presents a barrier to all DNA-based processes that require recruitment of enzymes to their sites of action. To allow DNA repair, the chromatin must be remodeled. In eukaryotes, ATP dependent chromatin remodeling complexes and histone-modifying enzymes are two predominant factors employed to accomplish this remodeling process. Chromatin relaxation occurs rapidly at the site of a DNA damage. In one of the earliest steps, the stress-activated protein kinase, c-Jun N-terminal kinase (JNK), phosphorylates SIRT6 on serine 10 in response to double-strand breaks or other DNA damage. This post-translational modification facilitates the mobilization of SIRT6 to DNA damage sites, and is required for efficient recruitment of poly (ADP-ribose) polymerase 1 (PARP1) to DNA break sites and for efficient repair of DSBs. PARP1 protein starts to appear at DNA damage sites in less than a second, with half maximum accumulation within 1.6 seconds after the damage occurs. PARP1 synthesizes polymeric adenosine diphosphate ribose (poly (ADP-ribose) or PAR) chains on itself. Next the chromatin remodeler ALC1 quickly attaches to the product of PARP1 action, a poly-ADP ribose chain, and ALC1 completes arrival at the DNA damage within 10 seconds of the occurrence of the damage. About half of the maximum chromatin relaxation, presumably due to action of ALC1, occurs by 10 seconds. This then allows recruitment of the DNA repair enzyme MRE11, to initiate DNA repair, within 13 seconds. γH2AX, the phosphorylated form of H2AX is also involved in the early steps leading to chromatin decondensation after DNA double-strand breaks. The histone variant H2AX constitutes about 10% of the H2A histones in human chromatin. γH2AX (H2AX phosphorylated on serine 139) can be detected as soon as 20 seconds after irradiation of cells (with DNA double-strand break formation), and half maximum accumulation of γH2AX occurs in one minute. The extent of chromatin with phosphorylated γH2AX is about two million base pairs at the site of a DNA double-strand break. γH2AX does not, itself, cause chromatin decondensation, but within 30 seconds of irradiation, RNF8 protein can be detected in association with γH2AX. RNF8 mediates extensive chromatin decondensation, through its subsequent interaction with CHD4, a component of the nucleosome remodeling and deacetylase complex NuRD. DDB2 occurs in a heterodimeric complex with DDB1. This complex further complexes with the ubiquitin ligase protein CUL4A and with PARP1. This larger complex rapidly associates with UV-induced damage within chromatin, with half-maximum association completed in 40 seconds. 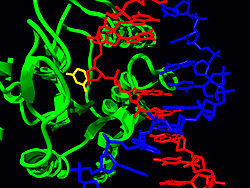 The PARP1 protein, attached to both DDB1 and DDB2, then PARylates (creates a poly-ADP ribose chain) on DDB2 that attracts the DNA remodeling protein ALC1. Action of ALC1 relaxes the chromatin at the site of UV damage to DNA. This relaxation allows other proteins in the nucleotide excision repair pathway to enter the chromatin and repair UV-induced cyclobutane pyrimidine dimer damages. After rapid chromatin remodeling, cell cycle checkpoints are activated to allow DNA repair to occur before the cell cycle progresses. First, two kinases, ATM and ATR are activated within 5 or 6 minutes after DNA is damaged. This is followed by phosphorylation of the cell cycle checkpoint protein Chk1, initiating its function, about 10 minutes after DNA is damaged. DNA damage checkpoint is a signal transduction pathway that blocks cell cycle progression in G1, G2 and metaphase and slows down the rate of S phase progression when DNA is damaged. It leads to a pause in cell cycle allowing the cell time to repair the damage before continuing to divide. Checkpoint Proteins can be separated into four groups: phosphatidylinositol 3-kinase (PI3K)-like protein kinase, proliferating cell nuclear antigen (PCNA)-like group, two serine/threonine(S/T) kinases and their adaptors. Central to all DNA damage induced checkpoints responses is a pair of large protein kinases belonging to the first group of PI3K-like protein kinases-the ATM (Ataxia telangiectasia mutated) and ATR (Ataxia- and Rad-related) kinases, whose sequence and functions have been well conserved in evolution. All DNA damage response requires either ATM or ATR because they have the ability to bind to the chromosomes at the site of DNA damage, together with accessory proteins that are platforms on which DNA damage response components and DNA repair complexes can be assembled. A number of individual genes have been identified as influencing variations in life span within a population of organisms. The effects of these genes is strongly dependent on the environment, in particular, on the organism's diet. Caloric restriction reproducibly results in extended lifespan in a variety of organisms, likely via nutrient sensing pathways and decreased metabolic rate. The molecular mechanisms by which such restriction results in lengthened lifespan are as yet unclear (see for some discussion); however, the behavior of many genes known to be involved in DNA repair is altered under conditions of caloric restriction. Several agents reported to have anti-aging properties have been shown to attenuate constitutive level of mTOR signaling, an evidence of reduction of metabolic activity, and concurrently to reduce constitutive level of DNA damage induced by endogenously generated reactive oxygen species. The C. elegans gene AGE-1, an upstream effector of DNA repair pathways, confers dramatically extended life span under free-feeding conditions but leads to a decrease in reproductive fitness under conditions of caloric restriction. This observation supports the pleiotropy theory of the biological origins of aging, which suggests that genes conferring a large survival advantage early in life will be selected for even if they carry a corresponding disadvantage late in life. Other diseases associated with reduced DNA repair function include Fanconi anemia, hereditary breast cancer and hereditary colon cancer. Because of inherent limitations in the DNA repair mechanisms, if humans lived long enough, they would all eventually develop cancer. There are at least 34 Inherited human DNA repair gene mutations that increase cancer risk. Many of these mutations cause DNA repair to be less effective than normal. In particular, Hereditary nonpolyposis colorectal cancer (HNPCC) is strongly associated with specific mutations in the DNA mismatch repair pathway. BRCA1 and BRCA2, two important genes whose mutations confer a hugely increased risk of breast cancer on carriers, are both associated with a large number of DNA repair pathways, especially NHEJ and homologous recombination. Cancer therapy procedures such as chemotherapy and radiotherapy work by overwhelming the capacity of the cell to repair DNA damage, resulting in cell death. Cells that are most rapidly dividing – most typically cancer cells – are preferentially affected. The side-effect is that other non-cancerous but rapidly dividing cells such as progenitor cells in the gut, skin, and hematopoietic system are also affected. Modern cancer treatments attempt to localize the DNA damage to cells and tissues only associated with cancer, either by physical means (concentrating the therapeutic agent in the region of the tumor) or by biochemical means (exploiting a feature unique to cancer cells in the body). ...; in the context of therapies targeting DNA damage response genes, the latter approach has been termed 'synthetic lethality'. Perhaps the most well-known of these 'synthetic lethality' drugs is the poly(ADP-ribose) polymerase 1 (PARP1) inhibitor olaparib, which was approved by the Food and Drug Administration in 2015 for the treatment in women of BRCA-defective ovarian cancer. Tumor cells with partial loss of DNA damage response (specifically, homologous recombination repair) are dependent on another mechanism – single-strand break repair – which is a mechanism consisting, in part, of the PARP1 gene product. Olaparib is combined with chemotherapeutics to inhibit single-strand break repair induced by DNA damage caused by the co-administered chemotherapy. Tumor cells relying on this residual DNA repair mechanism are unable to repair the damage and hence are not able to survive and proliferate, whereas normal cells can repair the damage with the functioning homologous recombination mechanism. Many other drugs for use against other residual DNA repair mechanisms commonly found in cancer are currently under investigation. However, synthetic lethality therapeutic approaches have been questioned due to emerging evidence of acquired resistance, achieved through rewiring of DNA damage response pathways and reversion of previously-inhibited defects. It has become apparent over the past several years that the DNA damage response acts as a barrier to the malignant transformation of preneoplastic cells. Previous studies have shown an elevated DNA damage response in cell-culture models with oncogene activation and preneoplastic colon adenomas. DNA damage response mechanisms trigger cell-cycle arrest, and attempt to repair DNA lesions or promote cell death/senescence if repair is not possible. Replication stress is observed in preneoplastic cells due to increased proliferation signals from oncogenic mutations. Replication stress is characterized by: increased replication initiation/origin firing; increased transcription and collisions of transcription-replication complexes; nucleotide deficiency; increase in reactive oxygen species (ROS). Replication stress, along with the selection for inactivating mutations in DNA damage response genes in the evolution of the tumor, leads to downregulation and/or loss of some DNA damage response mechanisms, and hence loss of DNA repair and/or senescence/programmed cell death. In experimental mouse models, loss of DNA damage response-mediated cell senescence was observed after using a short hairpin RNA (shRNA) to inhibit the double-strand break response kinase ataxia telangiectasia (ATM), leading to increased tumor size and invasiveness. Humans born with inherited defects in DNA repair mechanisms (for example, Li-Fraumeni syndrome) have a higher cancer risk. The prevalence of DNA damage response mutations differs across cancer types; for example, 30% of breast invasive carcinomas have mutations in genes involved in homologous recombination. In cancer, downregulation is observed across all DNA damage response mechanisms (base excision repair (BER), nucleotide excision repair (NER), DNA mismatch repair (MMR), homologous recombination repair (HR), non-homologous end joining (NHEJ) and translesion DNA synthesis (TLS). As well as mutations to DNA damage repair genes, mutations also arise in the genes responsible for arresting the cell cycle to allow sufficient time for DNA repair to occur, and some genes are involved in both DNA damage repair and cell cycle checkpoint control, for example ATM and checkpoint kinase 2 (CHEK2) – a tumor suppressor that is often absent or downregulated in non-small cell lung cancer. Reduced expression of DNA repair genes causes deficient DNA repair. When DNA repair is deficient DNA damages remain in cells at a higher than usual level and these excess damages cause increased frequencies of mutation or epimutation. Mutation rates increase substantially in cells defective in DNA mismatch repair or in homologous recombinational repair (HRR). Chromosomal rearrangements and aneuploidy also increase in HRR defective cells. A chart of common DNA damaging agents, examples of lesions they cause in DNA, and pathways used to repair these lesions. Also shown are many of the genes in these pathways, an indication of which genes are epigenetically regulated to have reduced (or increased) expression in various cancers. It also shows genes in the error prone microhomology-mediated end joining pathway with increased expression in various cancers. In further examples (tabulated in Table 4 of this reference), epigenetic defects were found at frequencies of between 13%–100% for the DNA repair genes BRCA1, WRN, FANCB, FANCF, MGMT, MLH1, MSH2, MSH4, ERCC1, XPF, NEIL1 and ATM. These epigenetic defects occurred in various cancers (e.g. breast, ovarian, colorectal and head and neck). Two or three deficiencies in the expression of ERCC1, XPF or PMS2 occur simultaneously in the majority of the 49 colon cancers evaluated by Facista et al. 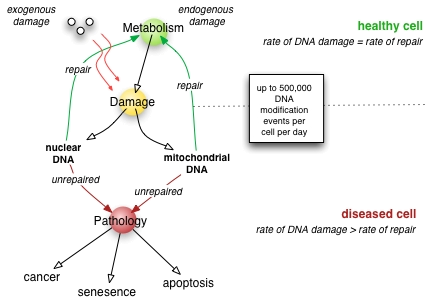 The chart in this section shows some frequent DNA damaging agents, examples of DNA lesions they cause, and the pathways that deal with these DNA damages. At least 169 enzymes are either directly employed in DNA repair or influence DNA repair processes. Of these, 83 are directly employed in repairing the 5 types of DNA damages illustrated in the chart. Some of the more well studied genes central to these repair processes are shown in the chart. The gene designations shown in red, gray or cyan indicate genes frequently epigenetically altered in various types of cancers. Wikipedia articles on each of the genes highlighted by red, gray or cyan describe the epigenetic alteration(s) and the cancer(s) in which these epimutations are found. Four review articles, and two broad experimental survey articles also document most of these epigenetic DNA repair deficiencies in cancers. Red-highlighted genes are frequently reduced or silenced by epigenetic mechanisms in various cancers. When these genes have low or absent expression, DNA damages can accumulate. Replication errors past these damages (see translesion synthesis) can lead to increased mutations and, ultimately, cancer. Epigenetic repression of DNA repair genes in accurate DNA repair pathways appear to be central to carcinogenesis. The two gray-highlighted genes RAD51 and BRCA2, are required for homologous recombinational repair. They are sometimes epigenetically over-expressed and sometimes under-expressed in certain cancers. As indicated in the Wikipedia articles on RAD51 and BRCA2, such cancers ordinarily have epigenetic deficiencies in other DNA repair genes. These repair deficiencies would likely cause increased unrepaired DNA damages. The over-expression of RAD51 and BRCA2 seen in these cancers may reflect selective pressures for compensatory RAD51 or BRCA2 over-expression and increased homologous recombinational repair to at least partially deal with such excess DNA damages. In those cases where RAD51 or BRCA2 are under-expressed, this would itself lead to increased unrepaired DNA damages. Replication errors past these damages (see translesion synthesis) could cause increased mutations and cancer, so that under-expression of RAD51 or BRCA2 would be carcinogenic in itself. Cyan-highlighted genes are in the microhomology-mediated end joining (MMEJ) pathway and are up-regulated in cancer. MMEJ is an additional error-prone inaccurate repair pathway for double-strand breaks. In MMEJ repair of a double-strand break, an homology of 5–25 complementary base pairs between both paired strands is sufficient to align the strands, but mismatched ends (flaps) are usually present. MMEJ removes the extra nucleotides (flaps) where strands are joined, and then ligates the strands to create an intact DNA double helix. MMEJ almost always involves at least a small deletion, so that it is a mutagenic pathway. FEN1, the flap endonuclease in MMEJ, is epigenetically increased by promoter hypomethylation and is over-expressed in the majority of cancers of the breast, prostate, stomach, neuroblastomas, pancreas, and lung. PARP1 is also over-expressed when its promoter region ETS site is epigenetically hypomethylated, and this contributes to progression to endometrial cancer, BRCA-mutated ovarian cancer, and BRCA-mutated serous ovarian cancer. Other genes in the MMEJ pathway are also over-expressed in a number of cancers (see MMEJ for summary), and are also shown in cyan. Differential activity of DNA repair pathways across various regions of the human genome causes mutations to be very unevenly distributed within tumor genomes. In particular, the gene-rich, early-replicating regions of the human genome exhibit lower mutation frequencies than the gene-poor, late-replicating heterochromatin. One mechanism underlying this involves the histone modification H3K36me3, which can recruit mismatch repair proteins, thereby lowering mutation rates in H3K36me3-marked regions. Another important mechanism concerns nucleotide excision repair, which can be recruited by the transcription machinery, lowering somatic mutation rates in active genes and other open chromatin regions. The basic processes of DNA repair are highly conserved among both prokaryotes and eukaryotes and even among bacteriophages (viruses which infect bacteria); however, more complex organisms with more complex genomes have correspondingly more complex repair mechanisms. The ability of a large number of protein structural motifs to catalyze relevant chemical reactions has played a significant role in the elaboration of repair mechanisms during evolution. For an extremely detailed review of hypotheses relating to the evolution of DNA repair, see. On some occasions, DNA damage is not repaired, or is repaired by an error-prone mechanism that results in a change from the original sequence. When this occurs, mutations may propagate into the genomes of the cell's progeny. Should such an event occur in a germ line cell that will eventually produce a gamete, the mutation has the potential to be passed on to the organism's offspring. The rate of evolution in a particular species (or, in a particular gene) is a function of the rate of mutation. As a consequence, the rate and accuracy of DNA repair mechanisms have an influence over the process of evolutionary change. DNA damage protection and repair does not influence the rate of adaptation by gene regulation and by recombination and selection of alleles. On the other hand, DNA damage repair and protection does influence the rate of accumulation of irreparable, advantageous, code expanding, inheritable mutations, and slows down the evolutionary mechanism for expansion of the genome of organisms with new functionalities. The tension between evolvability and mutation repair and protection needs further investigation. A technology named clustered regularly interspaced short palindromic repeat (shortened to CRISPR-Cas9) was discovered in 2012. The new technology allows anyone with molecular biology training to alter the genes of any species with precision. It is cheaper, more efficient, and more precise than other technologies. With the help of CRISPR–Cas9, parts of a genome can be edited by scientists by removing, adding, or altering parts in a DNA sequence. ^ "Nature Reviews Series: DNA damage". Nature Reviews Molecular Cell Biology. 5 July 2017. Retrieved 7 November 2018. ^ a b Lodish H, Berk A, Matsudaira P, Kaiser CA, Krieger M, Scott MP, Zipursky SL, Darnell J (2004). Molecular Biology of the Cell (5th ed.). New York: WH Freeman. p. 963. ^ a b Acharya, PV (1971). "The isolation and partial characterization of age-correlated oligo-deoxyribo-ribonucleotides with covalently linked aspartyl-glutamyl polypeptides". Johns Hopkins Medical Journal. Supplement (1): 254–60. PMID 5055816. ^ a b Bjorksten, J; Acharya, PVN; Ashman, S; Wetlaufer, DB (1971). "Gerogenic fractions in the tritiated rat". Journal of the American Geriatrics Society. 19 (7): 561–74. doi:10.1111/j.1532-5415.1971.tb02577.x. PMID 5106728. ^ Browner, WS; Kahn, AJ; Ziv, E; Reiner, AP; Oshima, J; Cawthon, RM; Hsueh, WC; Cummings, SR. (2004). "The genetics of human longevity". Am J Med. 117 (11): 851–60. CiteSeerX 10.1.1.556.6874. doi:10.1016/j.amjmed.2004.06.033. PMID 15589490. ^ Broad, William J. (7 October 2015). "Nobel Prize in Chemistry Awarded to Tomas Lindahl, Paul Modrich and Aziz Sancar for DNA Studies". The New York Times. Retrieved 7 October 2015. ^ Staff (7 October 2015). "The Nobel Prize in Chemistry 2015 – DNA repair – providing chemical stability for life" (PDF). Nobel Prize. Retrieved 7 October 2015. ^ Roulston A, Marcellus RC, Branton PE (1999). "Viruses and apoptosis". Annu. Rev. Microbiol. 53: 577–628. doi:10.1146/annurev.micro.53.1.577. PMID 10547702. ^ Ohta, Toshihiro; Shin-ichi, Tokishita; Mochizuki, Kayo; Kawase, Jun; Sakahira, Masahide; Yamagata, Hideo (2006). "UV Sensitivity and Mutagenesis of the Extremely Thermophilic Eubacterium Thermus thermophilus HB27". Genes and Environment. 28 (2): 56–61. doi:10.3123/jemsge.28.56. ^ Braig, M; Schmitt, CA. (2006). "Oncogene-induced senescence: putting the brakes on tumor development". Cancer Res. 66 (6): 2881–2884. doi:10.1158/0008-5472.CAN-05-4006. PMID 16540631. ^ Lynch, MD. (2006). "How does cellular senescence prevent cancer?". DNA Cell Biol. 25 (2): 69–78. doi:10.1089/dna.2006.25.69. PMID 16460230. ^ Campisi J, d'Adda di Fagagna F (2007). "Cellular senescence: when bad things happen to good cells". Rev Mol Cell Biol. 8 (9): 729–40. doi:10.1038/nrm2233. PMID 17667954. ^ a b c Best, Benjamin P (2009). "Nuclear DNA damage as a direct cause of aging" (PDF). Rejuvenation Research. 12 (3): 199–208. CiteSeerX 10.1.1.318.738. doi:10.1089/rej.2009.0847. PMID 19594328. ^ Sancar, A. (2003). "Structure and function of DNA photolyase and cryptochrome blue-light photoreceptors". Chem Rev. 103 (6): 2203–37. doi:10.1021/cr0204348. PMID 12797829. ^ Michael Lynch, José Ignacio Lucas-Lledó; Lynch, M. (19 February 2009). "Evolution of Mutation Rates: Phylogenomic Analysis of the Photolyase/Cryptochrome Family". Molecular Biology and Evolution. 26 (5): 1143–1153. doi:10.1093/molbev/msp029. PMC 2668831. PMID 19228922. ^ a b c Watson JD, Baker TA, Bell SP, Gann A, Levine M, Losick R (2004). Molecular Biology of the Gene (5th ed.). Pearson Benjamin Cummings; CSHL Press. Ch. 9, 10. OCLC 936762772. ^ Volkert MR (1988). "Adaptive response of Escherichia coli to alkylation damage". Environmental and Molecular Mutagenesis. 11 (2): 241–55. doi:10.1002/em.2850110210. PMID 3278898. ^ a b c Willey, J; Sherwood, L; Woolverton, C (2014). Prescott's Microbiology. New York, New York: McGraw Hill. p. 381. ISBN 978-0-07-3402-40-6. ^ a b c d Reardon, J; Sancar, A (2006). Purification and Characterization of Escherichia coli and Human Nucleotide Excision Repair Enzyme Systems. Methods in Enzymology. 408. pp. 189–213. doi:10.1016/S0076-6879(06)08012-8. ISBN 9780121828134. PMID 16793370. ^ Berg, M; Tymoczko, J; Stryer, L (2012). Biochemistry 7th edition. New York: W.H. Freeman and Company. p. 840. ISBN 9781429229364. ^ Liang L, Deng L, Chen Y, Li GC, Shao C, Tischfield JA (2005). "Modulation of DNA end joining by nuclear proteins". J. Biol. Chem. 280 (36): 31442–9. doi:10.1074/jbc.M503776200. PMID 16012167. ^ a b Truong LN, Li Y, Shi LZ, Hwang PY, He J, Wang H, Razavian N, Berns MW, Wu X (2013). "Microhomology-mediated End Joining and Homologous Recombination share the initial end resection step to repair DNA double-strand breaks in mammalian cells". Proc. Natl. Acad. Sci. U.S.A. 110 (19): 7720–5. doi:10.1073/pnas.1213431110. PMC 3651503. PMID 23610439. ^ Wilson TE, Grawunder U, Lieber MR (July 1997). "Yeast DNA ligase IV mediates non-homologous DNA end joining". Nature. 388 (6641): 495–8. doi:10.1038/41365. PMID 9242411. ^ Moore JK, Haber JE (May 1996). "Cell cycle and genetic requirements of two pathways of nonhomologous end-joining repair of double-strand breaks in Saccharomyces cerevisiae". Molecular and Cellular Biology. 16 (5): 2164–73. doi:10.1128/mcb.16.5.2164. PMC 231204. PMID 8628283. ^ Boulton SJ, Jackson SP (September 1996). "Saccharomyces cerevisiae Ku70 potentiates illegitimate DNA double-strand break repair and serves as a barrier to error-prone DNA repair pathways". The EMBO Journal. 15 (18): 5093–103. PMC 452249. PMID 8890183. ^ Wilson TE, Lieber MR (August 1999). "Efficient processing of DNA ends during yeast nonhomologous end joining. Evidence for a DNA polymerase beta (Pol4)-dependent pathway". The Journal of Biological Chemistry. 274 (33): 23599–609. doi:10.1074/jbc.274.33.23599. PMID 10438542. ^ Budman J, Chu G (February 2005). "Processing of DNA for nonhomologous end-joining by cell-free extract". The EMBO Journal. 24 (4): 849–60. doi:10.1038/sj.emboj.7600563. PMC 549622. PMID 15692565. ^ Wang H, Perrault AR, Takeda Y, Qin W, Wang H, Iliakis G (September 2003). "Biochemical evidence for Ku-independent backup pathways of NHEJ". Nucleic Acids Research. 31 (18): 5377–88. doi:10.1093/nar/gkg728. PMC 203313. PMID 12954774. ^ Jung D, Alt FW (January 2004). "Unraveling V(D)J recombination; insights into gene regulation". Cell. 116 (2): 299–311. doi:10.1016/S0092-8674(04)00039-X. PMID 14744439. ^ Sharma S, Javadekar SM, Pandey M, Srivastava M, Kumari R, Raghavan SC (2015). "Homology and enzymatic requirements of microhomology-dependent alternative end joining". Cell Death Dis. 6 (3): e1697. doi:10.1038/cddis.2015.58. PMC 4385936. PMID 25789972. ^ Decottignies A (2013). "Alternative end-joining mechanisms: a historical perspective". Front Genet. 4: 48. doi:10.3389/fgene.2013.00048. PMC 3613618. PMID 23565119. ^ Zahradka K, Slade D, Bailone A, et al. (October 2006). "Reassembly of shattered chromosomes in Deinococcus radiodurans". Nature. 443 (7111): 569–73. doi:10.1038/nature05160. PMID 17006450. ^ LC Colis; P Raychaudhury; AK Basu (2008). "Mutational specificity of gamma-radiation-induced guanine-thymine and thymine-guanine intrastrand cross-links in mammalian cells and translesion synthesis past the guanine-thymine lesion by human DNA polymerase eta". Biochemistry. 47 (6): 8070–8079. doi:10.1021/bi800529f. PMC 2646719. PMID 18616294. ^ P Raychaudhury; Basu, Ashis K. (2011). "Genetic requirement for mutagenesis of the G[8,5-Me]T cross-link in Escherichia coli: DNA polymerases IV and V compete for error-prone bypass". Biochemistry. 50 (12): 2330–2338. doi:10.1021/bi102064z. PMC 3062377. PMID 21302943. ^ "Translesion Synthesis". Research.chem.psu.edu. Archived from the original on 10 March 2012. Retrieved 14 August 2012. ^ Wang, Z (2001). "Translesion synthesis by the UmuC family of DNA polymerases". Mutat. Res. 486 (2): 59–70. doi:10.1016/S0921-8777(01)00089-1. PMID 11425512. ^ Liu B, Yip RK, Zhou Z (2012). "Chromatin remodeling, DNA damage repair and aging". Curr. Genomics. 13 (7): 533–47. doi:10.2174/138920212803251373. PMC 3468886. PMID 23633913. ^ a b c Sellou H, Lebeaupin T, Chapuis C, Smith R, Hegele A, Singh HR, Kozlowski M, Bultmann S, Ladurner AG, Timinszky G, Huet S (2016). "The poly(ADP-ribose)-dependent chromatin remodeler Alc1 induces local chromatin relaxation upon DNA damage". Mol. Biol. Cell. 27 (24): 3791–3799. doi:10.1091/mbc.E16-05-0269. PMC 5170603. PMID 27733626. ^ a b Van Meter M, Simon M, Tombline G, May A, Morello TD, Hubbard BP, Bredbenner K, Park R, Sinclair DA, Bohr VA, Gorbunova V, Seluanov A (2016). "JNK Phosphorylates SIRT6 to Stimulate DNA Double-Strand Break Repair in Response to Oxidative Stress by Recruiting PARP1 to DNA Breaks". Cell Rep. 16 (10): 2641–50. doi:10.1016/j.celrep.2016.08.006. PMC 5089070. PMID 27568560. ^ Jazayeri A, Falck J, Lukas C, Bartek J, Smith GC, Lukas J, Jackson SP (2006). "ATM- and cell cycle-dependent regulation of ATR in response to DNA double-strand breaks". Nat. Cell Biol. 8 (1): 37–45. doi:10.1038/ncb1337. PMID 16327781. ^ Gartel AL, Tyner AL (June 2002). "The role of the cyclin-dependent kinase inhibitor p21 in apoptosis". Molecular Cancer Therapeutics. 1 (8): 639–49. PMID 12479224. ^ Janion, C. (2001). "Some aspects of the SOS response system-a critical survey". Acta Biochim Pol. 48 (3): 599–610. PMID 11833768. ^ a b Erill, I; Campoy, S; Barbé, J (2007). "Aeons of distress: an evolutionary perspective on the bacterial SOS response". FEMS Microbiol. Rev. 31 (6): 637–656. doi:10.1111/j.1574-6976.2007.00082.x. PMID 17883408. ^ Schlacher, K; Pham, P; Cox, MM; Goodman, MF. (2006). "Roles of DNA Polymerase V and RecA Protein in SOS Damage-Induced Mutation". Chem. Rev. 106 (2): 406–419. doi:10.1021/cr0404951. PMID 16464012. ^ Fry, RC; Begley, TJ; Samson, LD (2004). "Genome-wide responses to DNA-damaging agents". Annu Rev Microbiol. 59: 357–77. doi:10.1146/annurev.micro.59.031805.133658. PMID 16153173. ^ Espejel, S; Martin, M; Klatt, P; Martin-Caballero, J; Flores, JM; Blasco, MA. (2004). "Shorter telomeres, accelerated ageing and increased lymphoma in DNA-PKcs-deficient mice". EMBO Rep. 5 (5): 503–9. doi:10.1038/sj.embor.7400127. PMC 1299048. PMID 15105825. ^ De Boer, J; Andressoo, JO; De Wit, J; Huijmans, J; Beems, RB; Van Steeg, H; Weeda, G; Van Der Horst, GT; et al. (2002). "Premature aging in mice deficient in DNA repair and transcription". Science. 296 (5571): 1276–9. doi:10.1126/science.1070174. PMID 11950998. ^ Dollé ME, Busuttil RA, Garcia AM, Wijnhoven S, van Drunen E, Niedernhofer LJ, van der Horst G, Hoeijmakers JH, van Steeg H, Vijg J (April 2006). "Increased genomic instability is not a prerequisite for shortened lifespan in DNA repair deficient mice". Mutation Research. 596 (1–2): 22–35. doi:10.1016/j.mrfmmm.2005.11.008. PMID 16472827. ^ Kobayashi, Y; Narumi, I; Satoh, K; Funayama, T; Kikuchi, M; Kitayama, S; Watanabe, H. (2004). "Radiation response mechanisms of the extremely radioresistant bacterium Deinococcus radiodurans". Biol Sci Space. 18 (3): 134–5. PMID 15858357. ^ Spindler, SR. (2005). "Rapid and reversible induction of the longevity, anticancer and genomic effects of caloric restriction". Mech Ageing Dev. 126 (9): 960–6. doi:10.1016/j.mad.2005.03.016. PMID 15927235. ^ Halicka, HD; Zhao, H; Li, J; Lee, YS; Hsieh, TC; Wu, JM; Darzynkiewicz, Z (2012). "Potential anti-aging agents suppress the level of constitutive mTOR- and DNA damage- signaling". Aging (Albany NY). 4 (12): 952–65. doi:10.18632/aging.100521. PMC 3615161. PMID 23363784. ^ Tissenbaum, HA; Guarente, L. (2001). "Increased dosage of a sir-2 gene extends life span in Caenorhabditis elegans". Nature. 410 (6825): 227–30. doi:10.1038/35065638. PMID 11242085. ^ Cohen HY, Miller C, Bitterman KJ, Wall NR, Hekking B, Kessler B, Howitz KT, Gorospe M, de Cabo R, Sinclair DA (July 2004). "Calorie restriction promotes mammalian cell survival by inducing the SIRT1 deacetylase". Science. 305 (5682): 390–2. doi:10.1126/science.1099196. PMID 15205477. ^ Cabelof, DC; Yanamadala, S; Raffoul, JJ; Guo, Z; Soofi, A; Heydari, AR. (2003). "Caloric restriction promotes genomic stability by induction of base excision repair and reversal of its age-related decline". DNA Repair (Amst.). 2 (3): 295–307. doi:10.1016/S1568-7864(02)00219-7. PMID 12547392. ^ Stuart, JA; Karahalil, B; Hogue, BA; Souza-Pinto, NC; Bohr, VA. (2004). "Mitochondrial and nuclear DNA base excision repair are affected differently by caloric restriction". FASEB J. 18 (3): 595–7. doi:10.1096/fj.03-0890fje. PMID 14734635. ^ Walker, DW; McColl, G; Jenkins, NL; Harris, J; Lithgow, GJ. (2000). "Evolution of lifespan in C. elegans". Nature. 405 (6784): 296–7. doi:10.1038/35012693. PMID 10830948. ^ Johnson, George (28 December 2010). "Unearthing Prehistoric Tumors, and Debate". The New York Times. If we lived long enough, sooner or later we all would get cancer. ^ Alberts, B; Johnson A; Lewis J; et al. (2002). "The Preventable Causes of Cancer". Molecular biology of the cell (4th ed.). New York: Garland Science. ISBN 978-0-8153-4072-0. A certain irreducible background incidence of cancer is to be expected regardless of circumstances: mutations can never be absolutely avoided, because they are an inescapable consequence of fundamental limitations on the accuracy of DNA replication, as discussed in Chapter 5. If a human could live long enough, it is inevitable that at least one of his or her cells would eventually accumulate a set of mutations sufficient for cancer to develop. ^ Friedenson B (August 2007). "The BRCA1/2 pathway prevents hematologic cancers in addition to breast and ovarian cancers". BMC Cancer. 7: 152. doi:10.1186/1471-2407-7-152. PMC 1959234. PMID 17683622. ^ Gavande NS, VanderVere-Carozza PS, Hinshaw HD, Jalal SI, Sears CR, Pawelczak KS, Turchi JJ (April 2016). "DNA repair targeted therapy: The past or future of cancer treatment?". Pharmacol. Ther. 160: 65–83. doi:10.1016/j.pharmthera.2016.02.003. PMC 4811676. PMID 26896565. ^ Bryant HE, Schultz N, Thomas HD, Parker KM, Flower D, Lopez E, Kyle S, Meuth M, Curtin NJ, Helleday T (April 2005). "Specific killing of BRCA2-deficient tumours with inhibitors of poly(ADP-ribose) polymerase". Nature. 434 (7035): 913–7. doi:10.1038/nature03443. PMID 15829966. ^ Goldstein M, Kastan MB (2015). "The DNA damage response: implications for tumor responses to radiation and chemotherapy". Annu Rev Med. 66: 129–43. doi:10.1146/annurev-med-081313-121208. PMID 25423595. ^ a b Jeggo PA, Pearl LH, Carr AM (January 2016). "DNA repair, genome stability and cancer: a historical perspective". Nat Rev Cancer. 16 (1): 35–42. doi:10.1038/nrc.2015.4. PMID 26667849. ^ Bartkova J, Horejsi Z, et al. (April 2005). "DNA damage response as a candidate anti-cancer barrier in early human tumorigenesis". Nature. 434 (7035): 864–70. doi:10.1038/nature03482. PMID 15829956. ^ a b Bartkova J, Rezaei N, et al. (November 2006). "Oncogene-induced senescence is part of the tumorigenesis barrier imposed by DNA damage checkpoints". Nature. 444 (7119): 633–7. doi:10.1038/nature05268. PMID 17136093. ^ Gaillard H, Garcia-Muse T, Aguilera A (May 2015). "Replication stress and cancer". Nat Rev Cancer. 15 (5): 276–89. doi:10.1038/nrc3916. hdl:10261/123721. PMID 25907220. ^ Halazonetis TD, Gorgoulis VG, Bartek J (March 2008). "An oncogene-induced DNA damage model for cancer development". Science. 319 (5868): 1352–5. doi:10.1126/science.1140735. PMID 18323444. ^ de Boer J, Heoijmakers JH (March 2000). "Nucleotide excision repair and human syndromes". Carcinogenesis. 21 (3): 453–60. doi:10.1093/carcin/21.3.453. PMID 10688865. ^ Broustas CG, Lieberman HB (February 2014). "DNA damage response genes and the development of cancer metastasis". Radiat Res. 181 (2): 111–30. doi:10.1667/RR13515.1. PMC 4064942. PMID 24397478. ^ Zhang P, Wang J, Gao W, Yuan BZ, Rogers J, Reed E (May 2004). "CHK2 kinase expression is down-regulated due to promoter methylation in non-small cell lung cancer". Mol Cancer. 3 (4): 3–14. doi:10.1186/1476-4598-3-14. PMC 419366. PMID 15125777. ^ Baylin SB; Ohm, Joyce E. (February 2006). "Epigenetic gene silencing in cancer – a mechanism for early oncogenic pathway addiction?". Nat. Rev. Cancer. 6 (2): 107–16. doi:10.1038/nrc1799. PMID 16491070. ^ Baldassarre G, Battista S, Belletti B, et al. (April 2003). "Negative regulation of BRCA1 gene expression by HMGA1 proteins accounts for the reduced BRCA1 protein levels in sporadic breast carcinoma". Molecular and Cellular Biology. 23 (7): 2225–38. doi:10.1128/MCB.23.7.2225-2238.2003. PMC 150734. PMID 12640109. ^ Jacinto FV, Esteller M; Esteller, M. (July 2007). "Mutator pathways unleashed by epigenetic silencing in human cancer". Mutagenesis. 22 (4): 247–53. doi:10.1093/mutage/gem009. PMID 17412712. ^ Bernstein C, Nfonsam V, Prasad AR, Bernstein H (March 2013). "Epigenetic field defects in progression to cancer". World J Gastrointest Oncol. 5 (3): 43–9. doi:10.4251/wjgo.v5.i3.43. PMC 3648662. PMID 23671730. ^ Bernstein C, Prasad AR, Nfonsam V, Bernstein H. (2013). "Chapter 16: DNA Damage, DNA Repair and Cancer", New Research Directions in DNA Repair, Clark Chen (Ed. ), ISBN 978-953-51-1114-6, InTech. ^ Narayanan L, Fritzell JA, Baker SM, Liskay RM, Glazer PM (April 1997). "Elevated levels of mutation in multiple tissues of mice deficient in the DNA mismatch repair gene Pms2". Proceedings of the National Academy of Sciences of the United States of America. 94 (7): 3122–7. doi:10.1073/pnas.94.7.3122. PMC 20332. PMID 9096356. ^ Shen L, Kondo Y, Rosner GL, et al. (September 2005). "MGMT promoter methylation and field defect in sporadic colorectal cancer". Journal of the National Cancer Institute. 97 (18): 1330–8. doi:10.1093/jnci/dji275. PMID 16174854. ^ Psofaki V, Kalogera C, Tzambouras N, et al. (July 2010). "Promoter methylation status of hMLH1, MGMT, and CDKN2A/p16 in colorectal adenomas". World Journal of Gastroenterology. 16 (28): 3553–60. doi:10.3748/wjg.v16.i28.3553. PMC 2909555. PMID 20653064. ^ Lee KH, Lee JS, Nam JH, et al. (October 2011). "Promoter methylation status of hMLH1, hMSH2, and MGMT genes in colorectal cancer associated with adenoma-carcinoma sequence". Langenbeck's Archives of Surgery. 396 (7): 1017–26. doi:10.1007/s00423-011-0812-9. PMID 21706233. ^ Amatu A, Sartore-Bianchi A, Moutinho C, et al. (April 2013). "Promoter CpG island hypermethylation of the DNA repair enzyme MGMT predicts clinical response to dacarbazine in a phase II study for metastatic colorectal cancer". Clinical Cancer Research. 19 (8): 2265–72. doi:10.1158/1078-0432.CCR-12-3518. PMID 23422094. ^ Mokarram P, Zamani M, Kavousipour S, et al. (May 2013). "Different patterns of DNA methylation of the two distinct O6-methylguanine-DNA methyltransferase (O6-MGMT) promoter regions in colorectal cancer". Molecular Biology Reports. 40 (5): 3851–7. doi:10.1007/s11033-012-2465-3. PMID 23271133. ^ Truninger K, Menigatti M, Luz J, et al. (May 2005). "Immunohistochemical analysis reveals high frequency of PMS2 defects in colorectal cancer". Gastroenterology. 128 (5): 1160–71. doi:10.1053/j.gastro.2005.01.056. PMID 15887099. ^ Valeri N, Gasparini P, Fabbri M, et al. (April 2010). "Modulation of mismatch repair and genomic stability by miR-155". Proceedings of the National Academy of Sciences of the United States of America. 107 (15): 6982–7. doi:10.1073/pnas.1002472107. PMC 2872463. PMID 20351277. ^ Facista A, Nguyen H, Lewis C, et al. (2012). "Deficient expression of DNA repair enzymes in early progression to sporadic colon cancer". Genome Integrity. 3 (1): 3. doi:10.1186/2041-9414-3-3. PMC 3351028. PMID 22494821. ^ Xinrong Chen and Tao Chen (2011). "Chapter 18: Roles of MicroRNA in DNA Damage and Repair", DNA Repair, Inna Kruman (ed. ), ISBN 9789533076973, InTech. ^ Gao D, Herman JG, Guo M (June 2016). "The clinical value of aberrant epigenetic changes of DNA damage repair genes in human cancer". Oncotarget. 7 (24): 37331–37346. doi:10.18632/oncotarget.7949. PMC 5095080. PMID 26967246. ^ Jin B, Robertson KD (2013). "DNA methyltransferases, DNA damage repair, and cancer". Adv. Exp. Med. Biol. 754: 3–29. doi:10.1007/978-1-4419-9967-2_1. PMC 3707278. PMID 22956494. ^ Krishnan K, Steptoe AL, Martin HC, et al. (February 2013). "MicroRNA-182-5p targets a network of genes involved in DNA repair". RNA. 19 (2): 230–42. doi:10.1261/rna.034926.112. PMC 3543090. PMID 23249749. ^ Chaisaingmongkol J, Popanda O, Warta R, et al. (December 2012). "Epigenetic screen of human DNA repair genes identifies aberrant promoter methylation of NEIL1 in head and neck squamous cell carcinoma". Oncogene. 31 (49): 5108–16. doi:10.1038/onc.2011.660. PMID 22286769. ^ Singh P, Yang M, Dai H, Yu D, Huang Q, Tan W, Kernstine KH, Lin D, Shen B (2008). "Overexpression and hypomethylation of flap endonuclease 1 gene in breast and other cancers". Mol. Cancer Res. 6 (11): 1710–7. doi:10.1158/1541-7786.MCR-08-0269 (inactive 7 September 2018). PMC 2948671. PMID 19010819. ^ Lam JS, Seligson DB, Yu H, Li A, Eeva M, Pantuck AJ, Zeng G, Horvath S, Belldegrun AS (2006). "Flap endonuclease 1 is overexpressed in prostate cancer and is associated with a high Gleason score". BJU Int. 98 (2): 445–51. doi:10.1111/j.1464-410X.2006.06224.x. PMID 16879693. ^ Kim JM, Sohn HY, Yoon SY, Oh JH, Yang JO, Kim JH, Song KS, Rho SM, Yoo HS, Yoo HS, Kim YS, Kim JG, Kim NS (2005). "Identification of gastric cancer-related genes using a cDNA microarray containing novel expressed sequence tags expressed in gastric cancer cells". Clin. Cancer Res. 11 (2 Pt 1): 473–82. PMID 15701830. ^ Wang K, Xie C, Chen D (2014). "Flap endonuclease 1 is a promising candidate biomarker in gastric cancer and is involved in cell proliferation and apoptosis". Int. J. Mol. Med. 33 (5): 1268–74. doi:10.3892/ijmm.2014.1682. PMID 24590400. ^ Krause A, Combaret V, Iacono I, Lacroix B, Compagnon C, Bergeron C, Valsesia-Wittmann S, Leissner P, Mougin B, Puisieux A (2005). "Genome-wide analysis of gene expression in neuroblastomas detected by mass screening". Cancer Lett. 225 (1): 111–20. doi:10.1016/j.canlet.2004.10.035. PMID 15922863. ^ Iacobuzio-Donahue CA, Maitra A, Olsen M, Lowe AW, van Heek NT, Rosty C, Walter K, Sato N, Parker A, Ashfaq R, Jaffee E, Ryu B, Jones J, Eshleman JR, Yeo CJ, Cameron JL, Kern SE, Hruban RH, Brown PO, Goggins M (2003). "Exploration of global gene expression patterns in pancreatic adenocarcinoma using cDNA microarrays". Am. J. Pathol. 162 (4): 1151–62. doi:10.1016/S0002-9440(10)63911-9. PMC 1851213. PMID 12651607. ^ Sato M, Girard L, Sekine I, Sunaga N, Ramirez RD, Kamibayashi C, Minna JD (2003). "Increased expression and no mutation of the Flap endonuclease (FEN1) gene in human lung cancer". Oncogene. 22 (46): 7243–6. doi:10.1038/sj.onc.1206977. PMID 14562054. ^ Bi FF, Li D, Yang Q (2013). "Hypomethylation of ETS transcription factor binding sites and upregulation of PARP1 expression in endometrial cancer". Biomed Res Int. 2013: 1–5. doi:10.1155/2013/946268. PMC 3666359. PMID 23762867. ^ Li D, Bi FF, Cao JM, Cao C, Li CY, Liu B, Yang Q (2014). "Poly (ADP-ribose) polymerase 1 transcriptional regulation: a novel crosstalk between histone modification H3K9ac and ETS1 motif hypomethylation in BRCA1-mutated ovarian cancer". Oncotarget. 5 (1): 291–7. doi:10.18632/oncotarget.1549. PMC 3960209. PMID 24448423. ^ Bi FF, Li D, Yang Q (2013). "Promoter hypomethylation, especially around the E26 transformation-specific motif, and increased expression of poly (ADP-ribose) polymerase 1 in BRCA-mutated serous ovarian cancer". BMC Cancer. 13: 90. doi:10.1186/1471-2407-13-90. PMC 3599366. PMID 23442605. ^ Supek, Fran; Lehner, Ben (7 May 2015). "Differential DNA mismatch repair underlies mutation rate variation across the human genome". Nature. 521 (7550): 81–84. doi:10.1038/nature14173. ISSN 0028-0836. PMC 4425546. PMID 25707793. ^ a b Zheng, Christina L.; Wang, Nicholas J.; Chung, Jongsuk; Moslehi, Homayoun; Sanborn, J. Zachary; Hur, Joseph S.; Collisson, Eric A.; Vemula, Swapna S.; Naujokas, Agne (20 November 2014). "Transcription restores DNA repair to heterochromatin, determining regional mutation rates in cancer genomes". Cell Reports. 9 (4): 1228–1234. doi:10.1016/j.celrep.2014.10.031. ISSN 2211-1247. PMC 4254608. PMID 25456125. ^ Li, Feng; Mao, Guogen; Tong, Dan; Huang, Jian; Gu, Liya; Yang, Wei; Li, Guo-Min (25 April 2013). "The histone mark H3K36me3 regulates human DNA mismatch repair through its interaction with MutSα". Cell. 153 (3): 590–600. doi:10.1016/j.cell.2013.03.025. ISSN 1097-4172. PMC 3641580. PMID 23622243. ^ Supek, Fran; Lehner, Ben (27 July 2017). "Clustered Mutation Signatures Reveal that Error-Prone DNA Repair Targets Mutations to Active Genes". Cell. 170 (3): 534–547.e23. doi:10.1016/j.cell.2017.07.003. hdl:10230/35343. ISSN 1097-4172. PMID 28753428. ^ Polak, Paz; Lawrence, Michael S.; Haugen, Eric; Stoletzki, Nina; Stojanov, Petar; Thurman, Robert E; Garraway, Levi A.; Mirkin, Sergei; Getz, Gad (January 2014). "Reduced local mutation density in regulatory DNA of cancer genomes is linked to DNA repair". Nature Biotechnology. 32 (1): 71–75. doi:10.1038/nbt.2778. ISSN 1087-0156. PMC 4116484. PMID 24336318. ^ Cromie, GA; Connelly, JC; Leach, DR (2001). "Recombination at double-strand breaks and DNA ends: conserved mechanisms from phage to humans". Mol. Cell. 8 (6): 1163–74. doi:10.1016/S1097-2765(01)00419-1. PMID 11779493. ^ O'Brien, PJ. (2006). "Catalytic promiscuity and the divergent evolution of DNA repair enzymes". Chem Rev. 106 (2): 720–52. doi:10.1021/cr040481v. PMID 16464022. ^ Maresca, B; Schwartz, JH (2006). "Sudden origins: a general mechanism of evolution based on stress protein concentration and rapid environmental change". Anat Rec B New Anat. 289 (1): 38–46. doi:10.1002/ar.b.20089. PMID 16437551. ^ "CRISPR gene-editing tool has scientists thrilled — but nervous" CBC news. Author Kelly Crowe. November 30, 2015.